There’s no single path to getting hired as a concept artist. Everyone has their own journey and the industry is constantly changing. But concept art is a newer job in the entertainment art world. It’s a career path without very much information so any type of guide can prove immeasurably useful. The Ultimate Concept Art Career Guide by 3DTotal Publishing is perhaps the best starting point for anyone serious about concept art. It covers everything about working in the field across every medium from TV to movies and video games. So does this offer a practical guide for artists looking to go pro? And is this worth purchasing if you’re hoping to break in as a concept artist? The book spans almost 200 pages with a lengthy index and a glossary of industry terms. 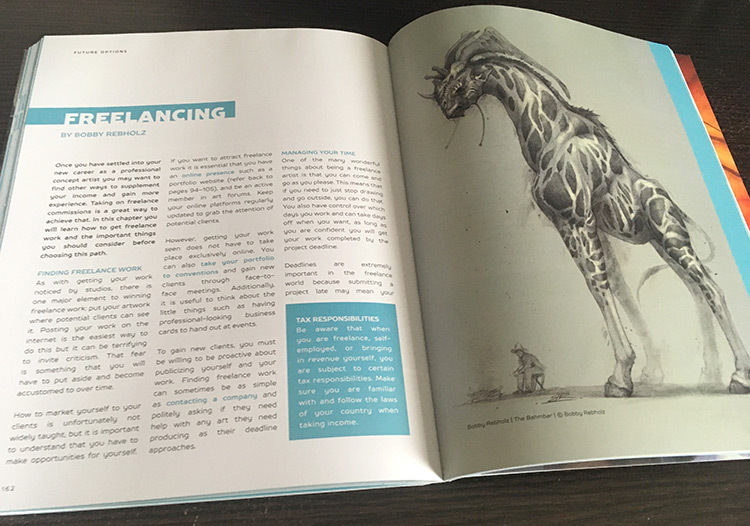 There’s also a section covering resources for concept artists with suggestions for software, books, and online learning for teaching yourself the skills you need right at home. 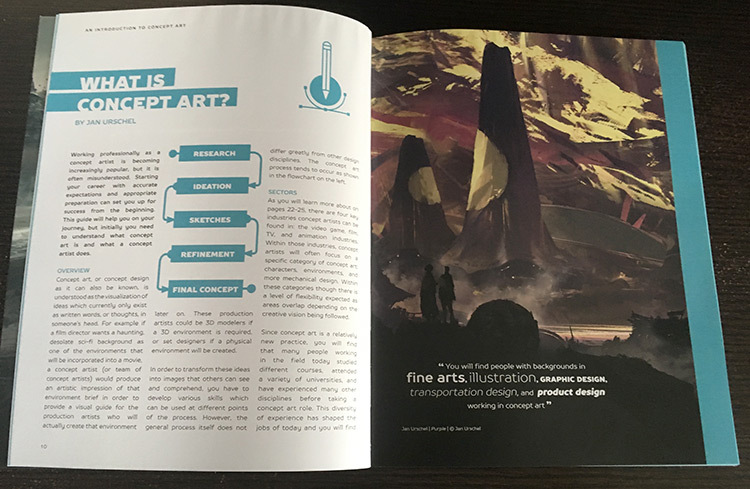 Most chapters delve into specific topics about concept art like how it works and what’s expected of different artists working in different areas. Also note each chapter has little “Artist Profile” snippets that read like kinda mini interviews. They capture the feelings and opinions of professional artists who have made their way into concept art jobs. I found these little snippets so valuable to help break up the content and offer inspiration while reading. This also seems geared towards younger artists who haven’t cemented their path yet. Granted you can get into concept art regardless of age or when you start drawing. Concept art, or concept design as it can also be known, is understood as the visualization of ideas which currently only exist as written words, or thoughts, in someone’s head. A bit wordy but accurate. The goal of a concept artist is to envision different ideas for worlds, characters, creatures, weapons, you name it. As you work through each chapter you’ll find golden nuggets that help paint a clearer picture of the industry and working as a concept artist. There’s a chapter on the typical workflow and the average workload of a studio concept artist. You’ll learn what’s expected of a professional artist in the field and how to handle projects. Imagine having this kind of information before even applying for a job! You’d be going into the interview with knowledge and foresight of exactly what the art director is looking for. Other chapters teach you about the best software to learn if you’re aspiring to work as a concept artist. If you want to do 2D concept art then you’ll be doing a lot of digital painting. Photoshop is the industry staple but you can also try Krita, Corel, Paint Tool Sai or Sketchbook. For 3D there’s a lot more. Big programs like Maya and Blender are very popular. But sculpting tools like ZBrush are also mentioned. And the book clarifies all of these programs by explaining how they work and why you’d want to learn them. Basically think of this book like a true roadmap for learning concept art. I know there isn’t really one out single road to follow… but this Ultimate Career Guide is the closest thing. Let me say this is not an instructional book for learning to paint or make art. You will not read this book and find exercises or techniques for painting. That requires work on your own studying from other teaching tools like painting courses. I’d say this book compares closely to Big Bad World of Concept Art which we also reviewed. 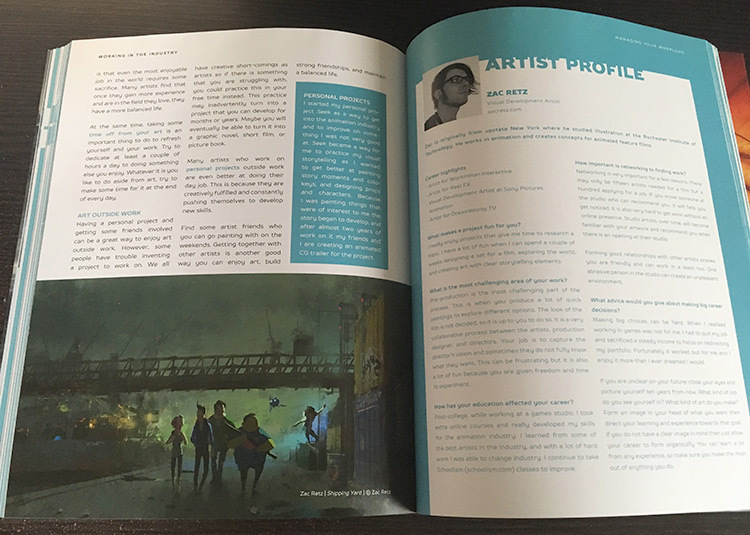 However The Ultimate Concept Art Career Guide offers more behind-the-scenes insight from professional artists. That’s what makes this a bit more entertaining along with more inspiring. 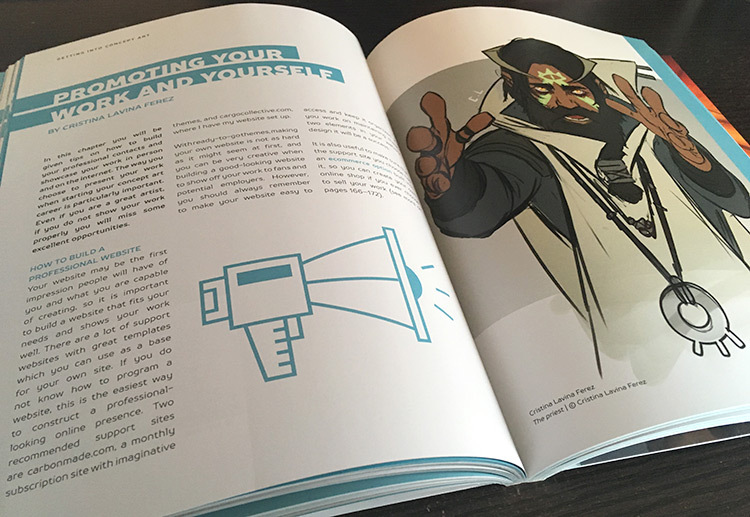 You’ll find dozens of pages covering how to present yourself and how to present your work. There’s even sample portfolios from professional concept artists to help you model your work in a similar fashion. Granted I can’t guarantee this book will land you a job. Nothing can guarantee that. What I can guarantee is with this book you’ll have all the knowledge necessary to start working towards a career. You’ll learn how to present yourself in a hireable manner and how to organize a killer portfolio. This book even has tips for designing and launching a usable portfolio website online. We have a guide on the step-by-step process of launching your own portfolio site but we don’t cover a lot about the specifics of web design. Even our design tips post isn’t as detailed as this book. So you’ll learn interviewing skills, designing a portfolio(and a website) with great work, how to land a job, and what the industry offers once you have a job. This includes personal organizational skills and how to cope with long projects in a stressful environment. Not to mention all the artist profiles and mini-interviews sharing advice plus the amazing artwork printed between these pages. This is truly a tome for helping aspiring concept artists and vis dev artists all over the world. If you’re a complete beginner just learning how to draw or paint then this book won’t help right away. You might still pick up a copy just to read through and learn about the industry. No harm in that! But you won’t be able to put the advice into action until you have semi-professional skills at least. I mostly recommend this book for existing artists who already know how to draw and paint fairly well. At least well enough to start developing a portfolio. Use this book more as a guide to navigate the confusing process of becoming a concept artist. And if you are a complete beginner don’t shy away from grabbing a copy. This book offers some real inspiration and can prove useful once your skills develop enough to build a portfolio. However beginners should also take a look at our recommended art books for newbies and spend more time practicing fundamentals. The hardest part of getting into concept art is getting recognized and getting your first job. Once you get into the industry you start making friends, build relationships, and then it usually gets easier to remain employed(especially if you’re good). 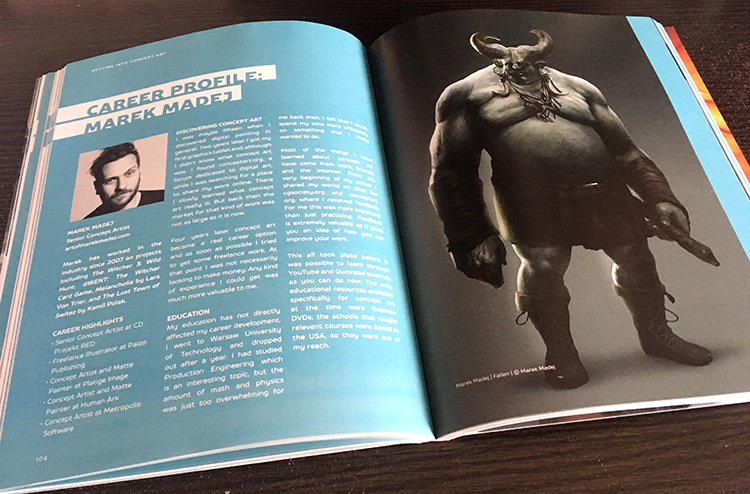 With The Ultimate Concept Art Career Guide you’ll cut down a lot of that frustration. You can learn how to present yourself to find jobs faster and to leave a lasting impression on your interviewer. Remember that everyone in the industry is just a person. There are no special rules or secret clubs… you just need to be a really awesome person and be awesome to work with. Chris Oatley describes this as the two rules for success in the entertainment art industry: do great work and be great to work with. Thankfully this guide takes you a whole lot further so it’s basically the primer for anyone ready to forge ahead with their dream of working in games, movies, TV or animation. With advice on teamwork, industry events, freelancing, crafting a portfolio, learning to critique your work and so much more… I really don’t think there’s much else we could ask for. Highly recommend this book for anyone looking at concept art as a serious career.